Hardwood Handle Attaches To A Dust Mop Frame To Make Removal Of Used Dust Mopheads Easier And Cleaning More Efficient. Sliding Collar Locks The Handle Into Position Or Allows A Full, 360-Degree Swivel Action. 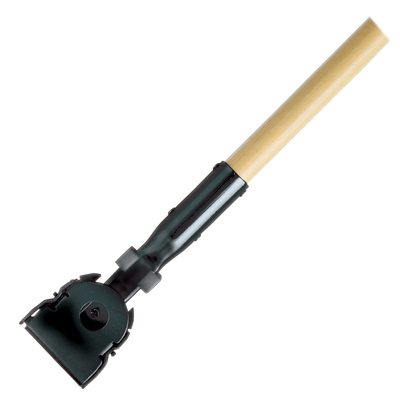 Spring-Loaded Clip Easily Attaches To The Rubbermaid Snap-On Dust Mop Frame (Sold Separately) Pick A Rubbermaid Dust Mophead Suited Just For Your Project For Customized Cleaning..
Hardwood Handle Attaches To A Dust Mop Frame To Make Removal Of Used Dust Mopheads Easier And Cleaning More Efficient. Sliding Collar Locks The Handle Into Position Or Allows A Full, 360-Degree Swivel Action. Spring-Loaded Clip Easily Attaches To The Rubbermaid Snap-On Dust Mop Frame (Sold Separately) Pick A Rubbermaid Dust Mophead Suited Just For Your Project For Customized Cleaning.